On Saturday Jane and I attended the opening of the extensively refurbished Eastburn Playing Fields. This is now a great place for kids and adults with a wetland area, sturdy play equipment, running track and trackbike rock pile. I was there with my number three lathe which was my first one and now usually lives in pieces in the garage at home. It was it’s first outing this year, and was as ever very popular, quite a few adults and children had a go, including a lady from Todmorden who wanted me to make here a chapatti rolling pin, and she put some work into it so she could say she helped make it. Jane was running an Aunt Sally shy which was perhaps even more popular than the lathe. We don’t play this Oxfordshire pub game up here so it had great novelty value. Basically you throw sticks to knock a stylised Aunt Sally from the top of a post, good simple fun. 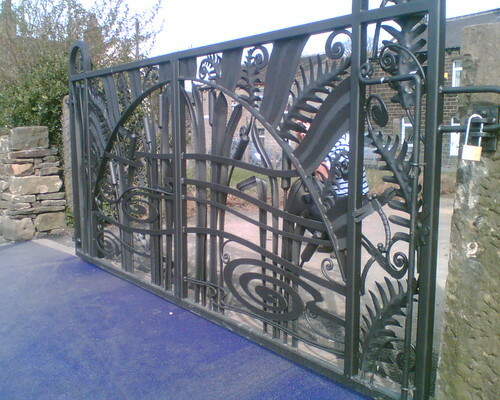 I was very keen on meeting my neighbour who was the blacksmith Jim Cooper from Bacup who’d made beautiful seating and gates for the playing fields. Get the little man with the questionmark hair – he’s a nut cracker! I asked for a poker/rake for our Big Bad Bessie woodburner as I need to pull logs to the front where the air comes in so the fire stays in. 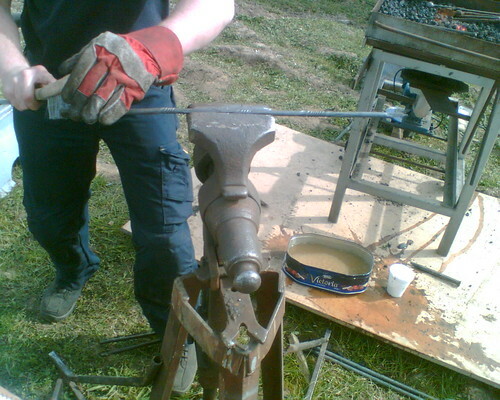 Jim found that the local soil worked as a very good welding flux as he made the poker for me. Wish I’d had my proper camera rather than my old phone. The poker turned out rather well, it’s great to have a poker made by a blacksmith owning the surname of another craft (cooper or barrel maker) who used to be a potter. 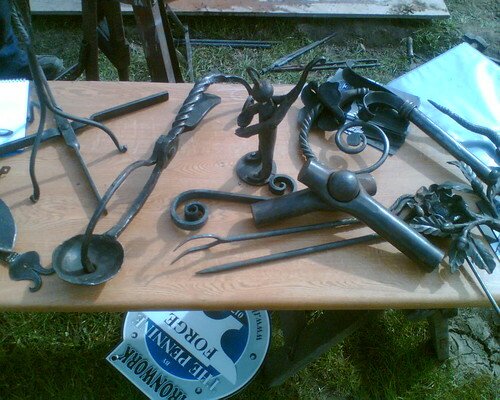 Jim says that potting and blacksmithing are pretty similar, starting with a formless material, the fire is just applied at opposite ends on the process. Jim’s thinking of running some night classes, which would be a great way for me to learn how to make bowl turning hooks, which Jim was very interested in as all crafts have their peculiar tools, mostly made by smiths. He’s made a broom squire’s clamp in the past for compressing the broom-head twigs while they’re tied. This entry was posted in Green woodwork and tagged blacksmith, broom squire, chapatti rolling pin, gates, pennine forge, poker, welding flux by Flying Shavings. Bookmark the permalink.